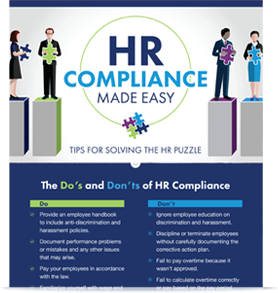 Do You Know the Do’s and Don’ts of HR Compliance? HR compliance impacts every employer and the cost of non-compliance can be significant — tens of thousands of dollars, if not more depending on the size of your organization. That is why it is so important for employers to understand the relevant compliance laws. Fill out the form to access your compliance checklist now.